At N Stuff Music we’ve got you a covered with a wide range of products available from our rental department. Our rental department has become the go-to place for rental gear for musicians, sound engineers, and a variety of customers from all over the city of Pittsburgh and the surrounding region. You’ll find that our selection of rental inventory and customer service is completely unmatched in the industry today. Looking to rent a power generator? No problem, N Stuff Music is here to help you out. Power generators are the unsung heroes of many outdoor gigs, parties, corporate events, or any situation in which power is not readily accessible. 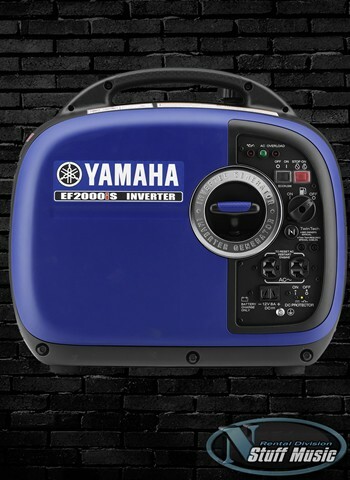 If you have an outdoor gig coming up and know that access to power is questionable save yourself the trouble and rent a power generator today from N Stuff Music. Powered generators are a great way to go if you are looking to host an outdoor event in which you would like music, a sound system, or any kind of speaking capability. For musicians you can combine a rental generator with one of our packages for rental PA systems and get a full setup for outdoor performance with completely clean and efficient power running to all of the equipment. When renting from N Stuff Music you can take the headache out of assembling all of the gear you need. We will work cooperatively with you to determine what cables, accessories, and equipment is needed for your function. Our rental packages are mere examples of what is a common rental setup that will get you started. We will certainly vary depending on what your needs are. Contact us today if you are interested in renting equipment and saving yourself the hassle of purchasing brand new equipment and desperately assembling your own setup. Leave it to us to get you going!